Holistic grooming is the practice of grooming your pet in a stress-free environment in order to provide optimal health for both body and mind. 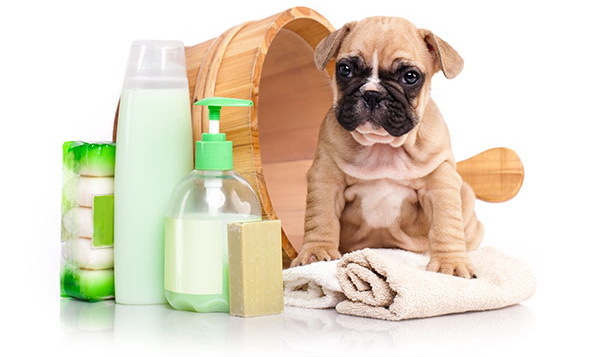 It developed out of a definite and clear need for pets to enjoy their necessary grooming, and to provide animals a better level of care as industry professionals have the ability and duty to do. I offer a fresh approach to mobile grooming! Having worked in salons, I understand the stresses a pet goes through in that environment. I provide a different experience. I strive to make grooming a peaceful and relaxing process, using minimal restraints and nothing but the best eco-friendly products custom-tailored to your pet’s needs. Being an animal lover and dog owner myself, I understand how important your pet is to your family. I care for pets gently and treat them as if they were my own to make them look and feel their best! I make every effort to be the best groomer (mobile or otherwise) that you’ve ever had. Sandy did an awesome job. We have a new rescue puppy, a Bichon mix. He needed a lot of work, and in 90 minutes she turned out a sparkling puppy. She has an awesome mobile unit and knows a lot about dogs. The dog warmed up to her quickly. I absolutely recommend her, am arranging for the next grooming. Howard C.
I had my first experience with Sandy and Pacific Mobile Grooming today. My dog was a mess and shedding like a blizzard. An hour later, she looks ten pounds lighter and is clean and fresh. What a difference. Great service and I am already scheduling another appointment. Thanks Sandy! Ron L.
We cannot say enough positive things about Sandy and her Pacific Mobile Grooming business! She did an AWESOME job trimming and grooming Gracie, our 8-yr.old Yorkie-mix grand-dog, according to our daughter’s specifications (“de-bulk & thin her coat but please leave some shag & wisps”)! This is THE BEST summer grooming Gracie has ever had. We would HIGHLY RECOMMEND Pacific Mobile Grooming! This is a first-rate business and Owner Sandy has the highest integrity, a warm personality, genuine care for the pets she works with, and she has accomplished grooming skills! Thank you, Sandy! We’re happy to have met you!! Jane D.
Sandy just came & groomed my fur baby & did such a GREAT job! This is the 1st time her haircut actually makes her still look like a cute Maltese & she cut her nails perfect & left her face looking like an adorable teddy bear! I highly recommend Sandy! She was so cute with my fur baby too. Thank you Sandy! Lisa W.
Sandra is the most knowledgeable, caring and loving groomer that I’ve ever known in all my years as a pet owner. To say that she has a real passion for her work, doesn’t even begin to say it all. If you’re lucky enough to have your pet groomed by Sandra, you’ll see the difference that it makes. Yvonne B.
I am a former paralegal who decided to finally follow my heart and work with animals for a living.